The first half of 2014 has been great, just about all of my ideas have been working, but I don't have any visions of this continuing at the current pace. However, a lot of value investors get too caught up in the macro picture, trying to outsmart the market by holding large cash positions, tweeting links to examples of excess in the market, and attempting to call a market top. It always sounds clever to be bearish and pessimistic, but it's not productive unless you're trying to build followers. I'd rather focus on finding a handful of mispriced securities than constantly worrying about when the next market correction is going to happen, it will at some point, but for smallish investors it leads to bad decision making. You'll see I disposed of the thrift/mutual bank conversions, I still like the strategy and will continue to highlight conversions I find attractive, but for now I'm going to pass until I increase the size of the portfolio or macro conditions change. I'm finding too many other opportunities available that don't have 2-3 year opportunity costs like a thrift conversion. I also work for a large bank and I'm fully aware of the headwinds facing the entire industry, especially those highly weighted towards net interest margin like small community banks. There are so many spinoffs happening right now it's hard to keep them all straight. Despite the value creation being fairly well known at this point, spinoffs still outperform as a group. I'm going to try to identify a few that I find interesting in the back half of the year. Then exploiting them either by buying a call option if I believe the spinoff is actually the more attractive asset (like OIS/CVEO), or wait until regular trading occurs and buy the spinoff if its the orphaned business that gets sold indiscrimately. 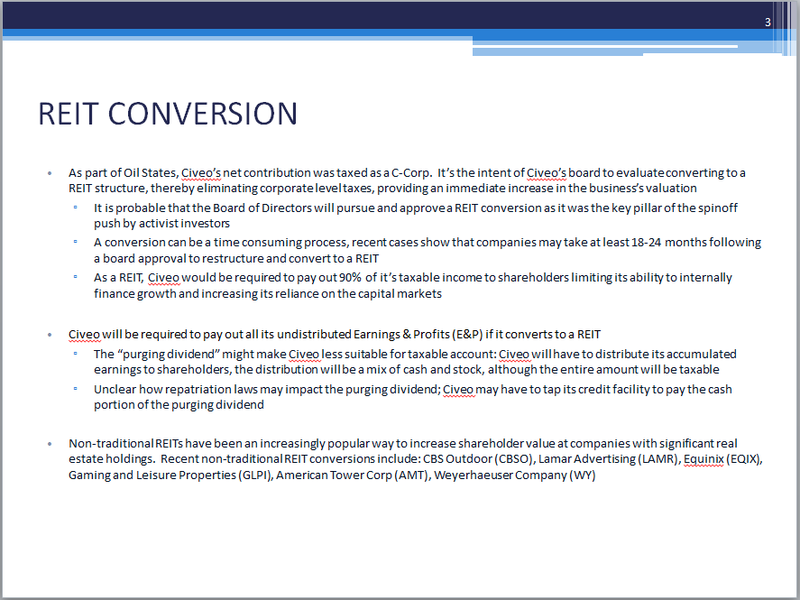 I also like the REIT conversion trend, curious to see if these conversions and tax inversions acquisitions will finally spark some corporate tax reform in Washington. Lots to like at Howard Hughes Corporation, they're aggressively investing in their "strategic assets" which will make their way into operating asset bucket over the next few years. 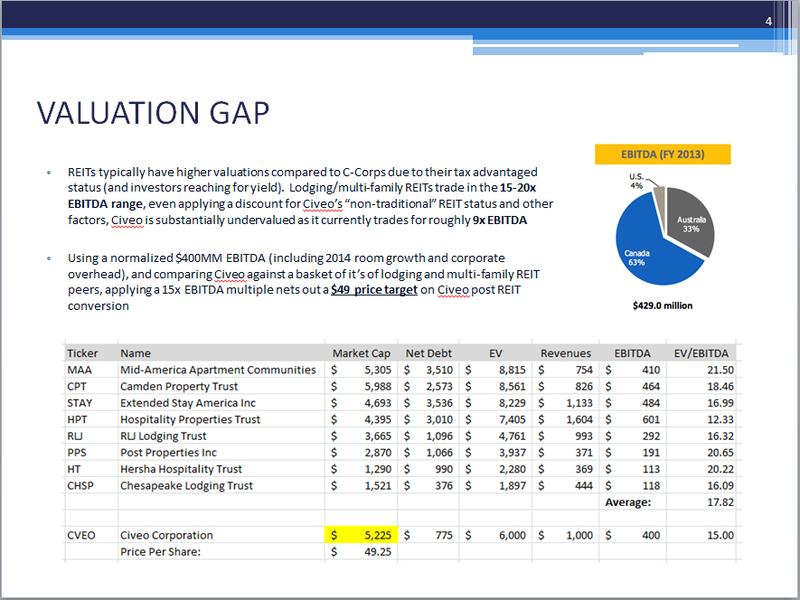 At some point in the future, it doesn't make sense to have these stabilized operating properties in a C-Corp structure, so another REIT spinoff could be in the offering once the NOLs are used up. I like this company as a long term compounder, they have quite a few levers to pull and a capital allocation/shareholder focused management. At a recent investor presentation, management quipped that an analyst's $200 price target was too low, I would agree. It's balance sheet has uncovered most of the hidden real estate value due to accounting consolidation rules already creating a quick gain. The question is what's next? I like the share repurchase program, but that doesn't really help the fact that they're too small to be a public company, and they're only breaking even on an operating basis. 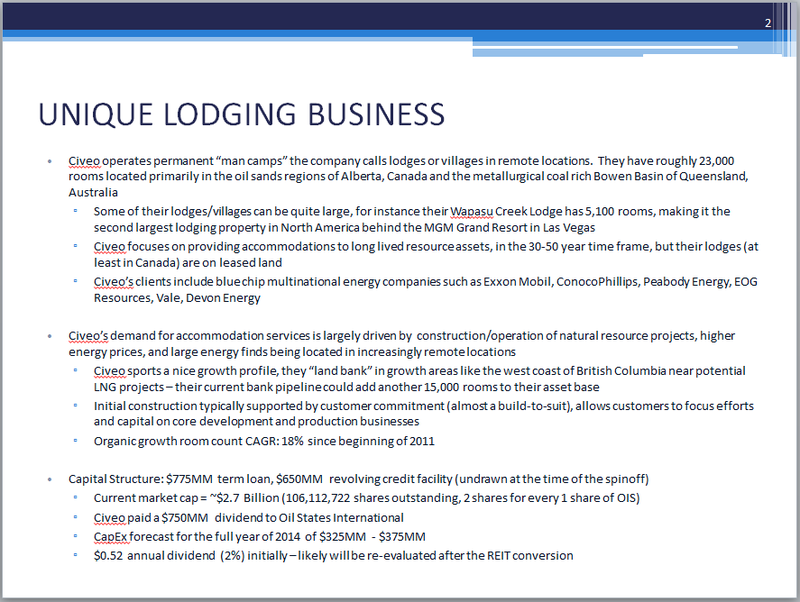 MuniMae has an incredible amount of NOLs, they should be initiating a rights offering and buying an operating business that throws off taxable income. It's no longer a screaming buy, but I'm going to hold and let the situation play out more. However, it's towards the top of the sell list if I need cash for a better idea. The Uinta Basin purchase is a nice bridge asset, its going to be cash flow positive right away and gives management and analysts something to focus on while waiting for natural gas to resume its climb up. There's still a huge spread between natural gas prices in the United States and what it fetches in foreign markets. Given the recent news about oil exports being allowed for the first time in 40 years, more LNG export terminal approvals might be in the offering as well, long term this spread should narrow. 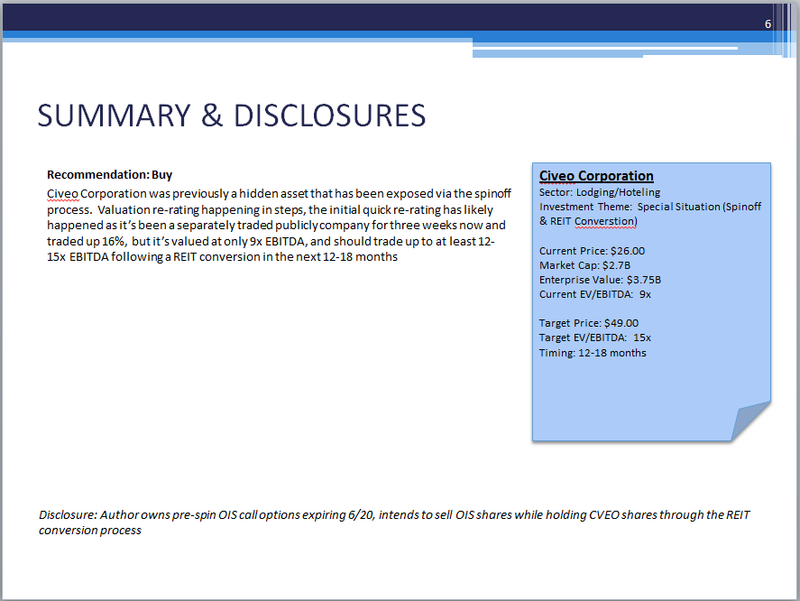 I gave an investment pitch at a CFA Society of Chicago roundtable today with a "Value investing in a not-so value world" topic theme, my idea was Civeo Corporation, below is the deck I used, been a great winner for me so far via a pre-spin call option that expired today. 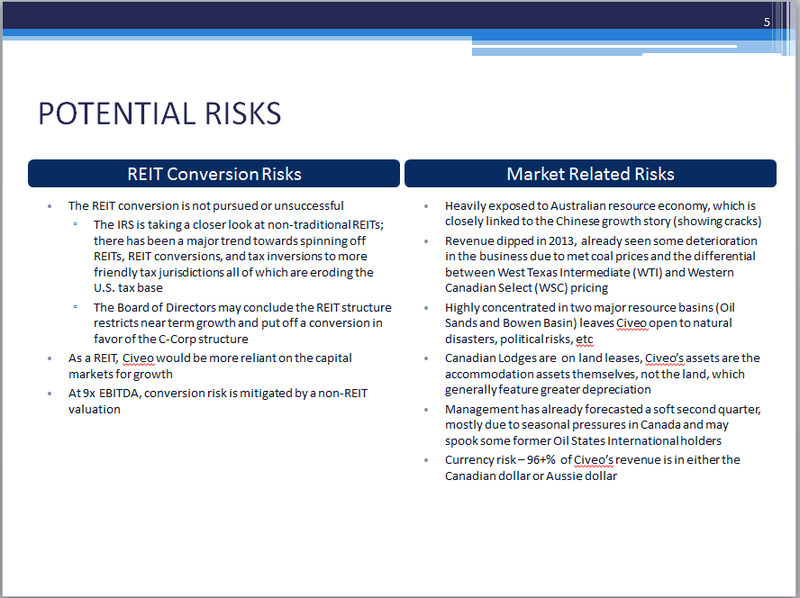 I presented a pretty bullish view for the purposes of the pitch, but I think it has decent room to the upside as they pursue a REIT conversion. Cadus Corporation (OTC:KDUS) might be familiar to a few value investors who enjoy having their patience tested. Cadus is a former drug development company that sold essentially all their assets in 1999 to OSI Pharmaceuticals (which itself was purchased by Astellas Pharma in 2010). Ever since Cadus has been more or less a shell company, with cash and some net operating loss carry forwards (zero revenues, no full time employees only a part time CEO earning $25,000 per year). Carl Icahn has been a major shareholder of the company since the mid-1990s, and has resisted calls from investors to liquidate the company citing the $19,341,000 of NOLs. It may seem tiny to a multi-billionaire, but Icahn is probably the type where it bothers him leaving any amount of money on the table. In February, he finally got moving and Cadus announced "the company is currently seeking opportunities to profit from purchasing land and residential homes for construction or renovation and resale in the state of Florida." He assigned his wife's son in law as the new CEO and as of 5/14/14, they have purchased 9 homes in Florida for $20.9 million, clearly targeting the upper end of the housing market. 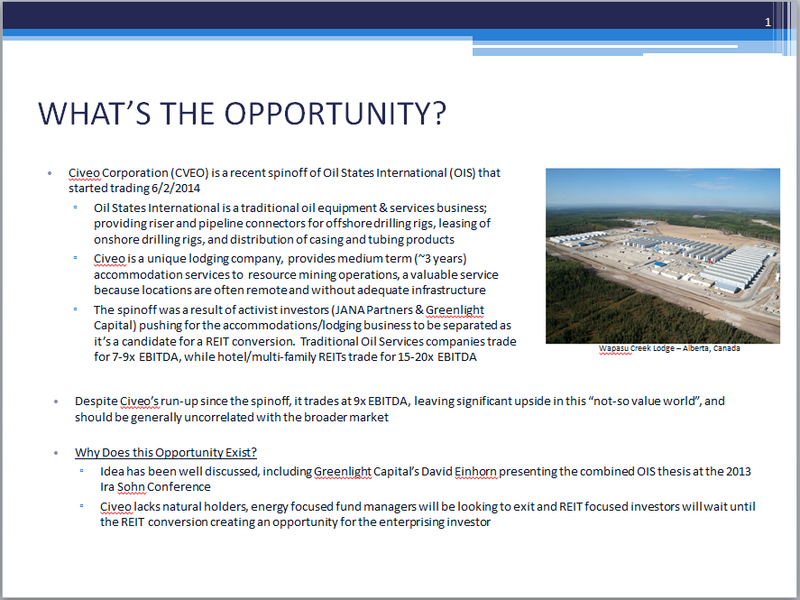 Cadus Corporation's strategy sounds similar to David Einhorn's strategy with BioFuel Energy, however with BioFuel they're buying a larger operating company and have significantly more NOLs to monetize. With Cadus, the house flipping venture appears short term in nature and maybe a simpler tactic to monetize the NOLs, and liquidate the company after the homes are sold? Cadus should also be a less stomach churning ride as the retail day traders have likely long forgotten about Cadus. The thesis is pretty simple with Cadus Corporation, it trades roughly at Icahn's recent cost basis and a liquid/current book value. If the luxury flipping operation works out well, Cadus should be able to use up the net operating losses in the next year or two. Due the short term nature of house flipping, I could see the company being liquidated once the tax asset is monetized. 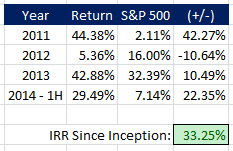 It's not going to be a multi-bagger, but could provide an attractive return with minimal downside.